Let’s take a look at what it takes to do well on the TACHS. Many Catholic high schools in New York City look at a student’s TACHS score to determine admission, placement, and scholarships. First, it’s important to know that there is no passing score for the TACHS. Students will be given a percentile based on their performance when compared to the other students who have to take the TACHS. While there is no magic score to get, it is still very important for students to try and maximize their scores, to score in the highest percentile possible. Like any standardized test, time management is important. As a result, it’s important to not just know the material on the test but know how to get the answers quickly. Each standardized test is different (TACHS and HSPT are different), meaning the way questions are asked aren’t always the same. Even though both tests may have a reading and a language section, the passages and format of the questions may be different. That is why it is important to not just study the material that appears on the tests but to become familiar with the questions and format of each test. Our online TACHS course covers the topics that appear on the test in our lessons, and they are followed by questions similar to the ones that students will see on the test. In addition, we have practice TACHS tests for students to get used to the format and learn their strengths and weaknesses. Students’ scores are reported as percentiles. Students will not get their actual grade on the test, but rather how they rank among other students. A percentile lets you know how high you rank. For example, a student in the 90th percentile for math scored higher than 90% of the students in math. It doesn’t mean that he answered 90% of the questions correctly. The score report will include a percentile for each of the four sections. For each section, a student will be given two percentiles. One for his performance against other students in his city and one for all students who took the TACHS. The test is broken down into four main sections: Reading, Written Expression, Mathematics, and Ability. The reading section will consist of short passages followed by questions about the passage. Students can read the passages in any order and skip ahead to read the questions before they read the passage. 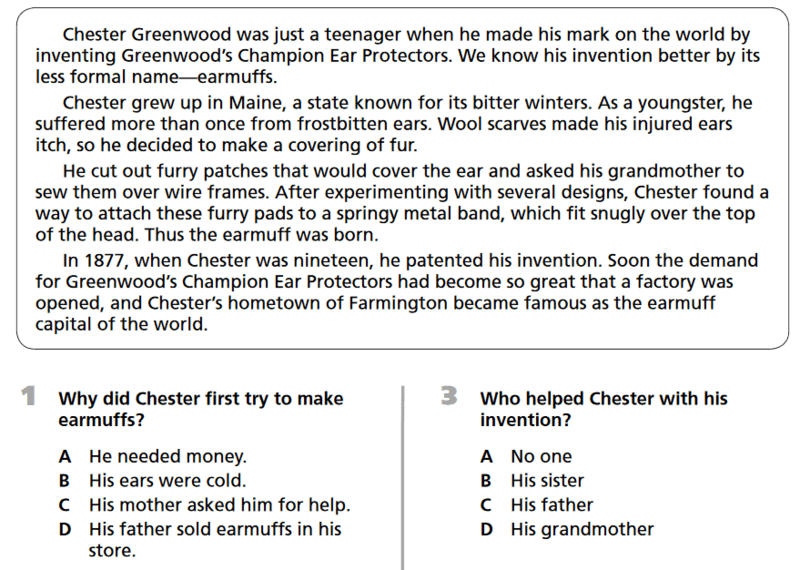 We suggest reading the questions first, before reading the passage, so students know what information to look out for. Students should not read the answer choices before reading the passages because reading the wrong answer choices may influence their thoughts while they read the passage. Written expression questions may present themselves as a paragraph followed by some questions on how to improve the paragraph or fix errors. They may also be single sentences in which students have to identify the error. The math section covers a lot of topics including integers, fractions, percents, word problems, algebra, and geometry. There are basically three types of questions that show up on the ability section. They are Figure Matrices, Paper Folding (Hole-Punch), and Figure Classification. For Figure Matrices questions, students are presented with a three by three matrix of figures. 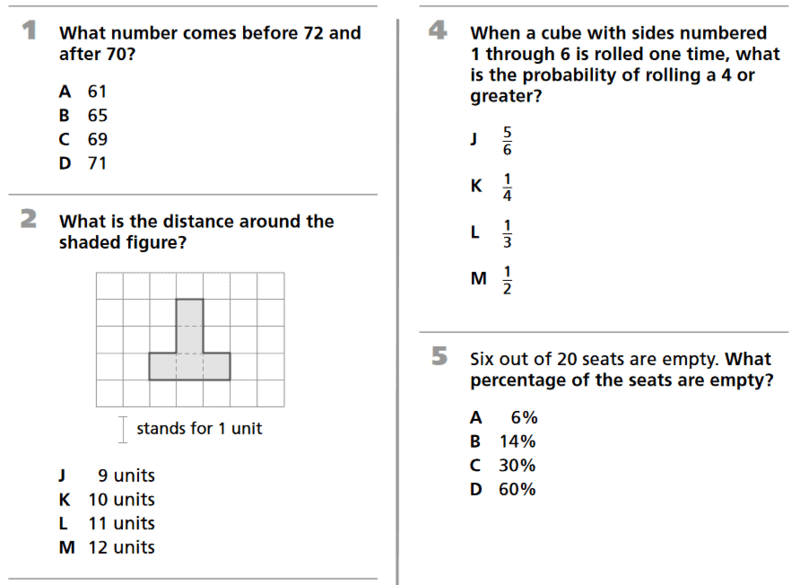 Typically the figure in the bottom right will be missing, and students have to determine which of the answer choices is the correct figure for the missing spot. There is a way in which the figures are related, sometimes by row and sometimes by column. There may be a common similarity or change between figures in each row or column. For the Paper Folding questions, a piece of paper is shown to have been folded one or more times. 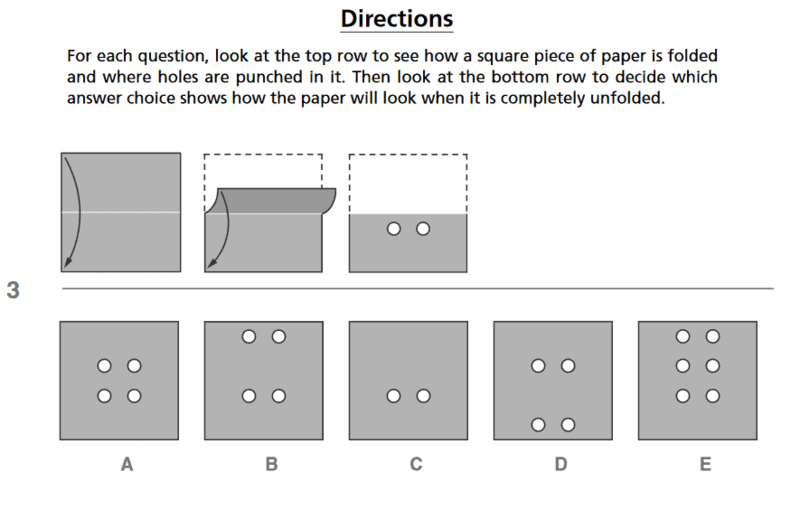 While it is folded, holes are punched through the paper. It is the student’s job to figure out what the paper would like when it is unfolded. For Figure Classification questions, three figures are shown together that have some special similarity. 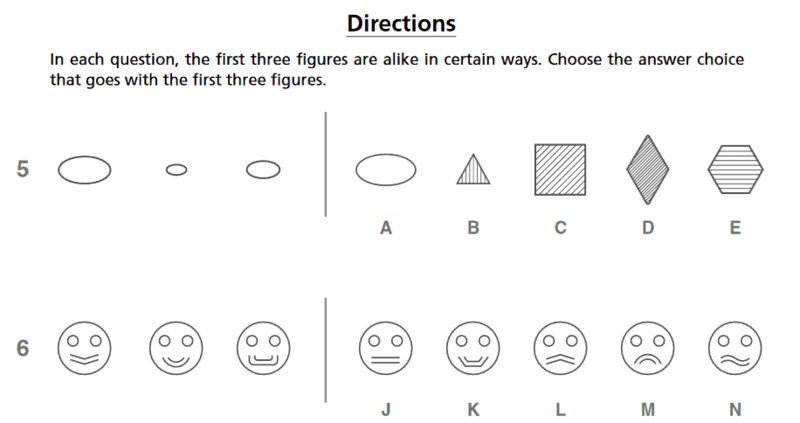 The student has to choose the figure from the answer choices that share that similarity.